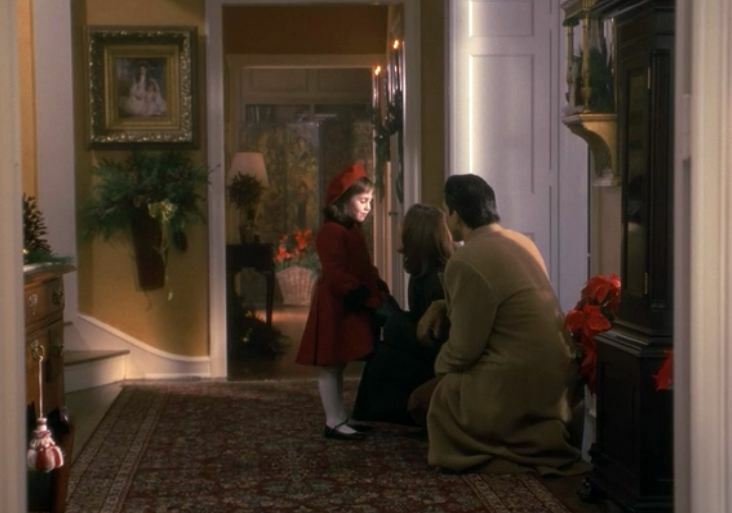 John Hughes produced an updated version of the holiday classic Miracle on 34th Street in 1994 starring Mara Wilson as Susan Walker, a little girl who wants this yellow house for Christmas. 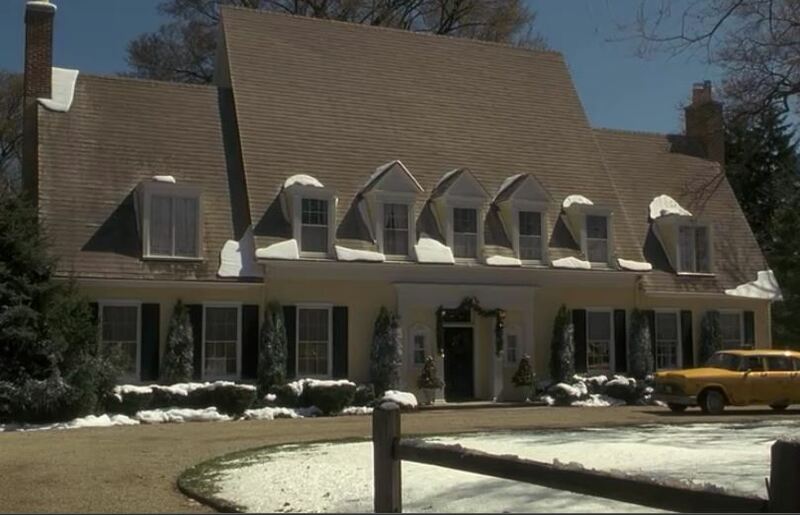 The real house they used for the movie is on the market in Lake Forest, Illinois, so let’s take a look! 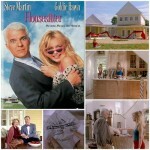 …the house in the remake was furnished and lavishly decorated. 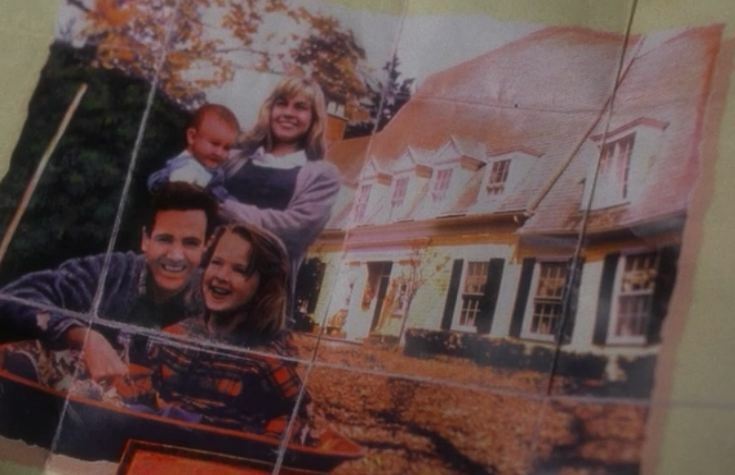 Every time I’ve seen this movie, I’ve wished we could see more of the house. I wrote about it back in 2011 but, although I knew it was in Lake Forest, Illinois, somewhere, I had never been able to track it down. 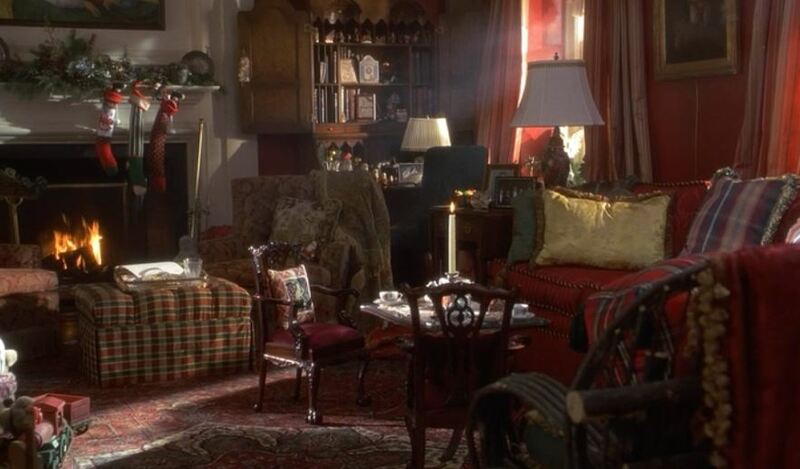 It looks like this might be the room where the scene with the Christmas tree was shot for the movie — it has a fireplace with a white mantel and trim and windows that look the same — but it’s hard to tell for sure. I was surprised to learn the house was built in 1924 because it looks newer than that. They’ve clearly done a lot of work on it over the years. In this aerial view you can see it’s bigger than it looks from the front, with about 6,000 square feet. That is a gorgeous house. The exterior is not my favorite style, though it’s pretty, but the interiors are swoon worthy. Especially that dining room. Wow! The upstairs is not a man cave! No way am I giving that over to manliness. That is my art and music room!!! Love this house! It was on trend in the 90’s, when it was in the film, and it’s on trend now. As Jana said, the living and dining rooms are a bit “foo-foo” 🙂 but that could be easily remedied. Hard to believe this place is as old as it is. It’s in fabulous condition. That paneled library! That property! That footprint! And don’t even get me started on that butler’s pantry! Great post, Julia. Thanks for doing this. I can’t believe I’m already thinking about Christmas, but I know I’m not alone, judging by the number of holiday related pins I’m seeing on Pinterest. LOVE, LOVE! 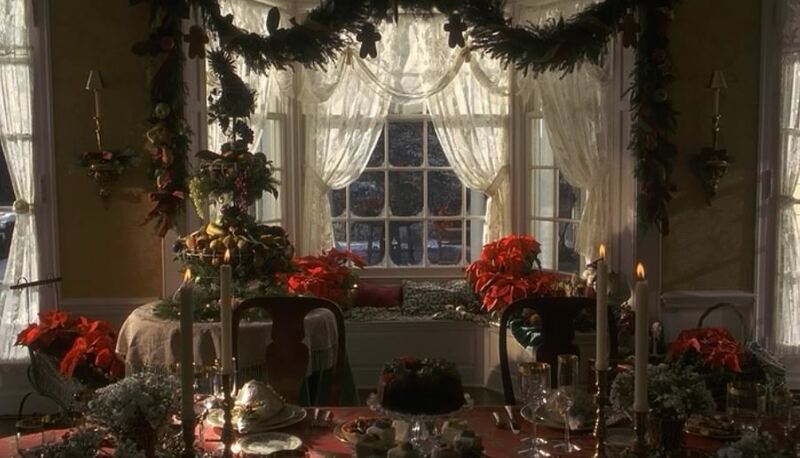 I do love a traditional home and it’s a plus to see one from a favored movie. Thanks for sharing! LOVE this house. 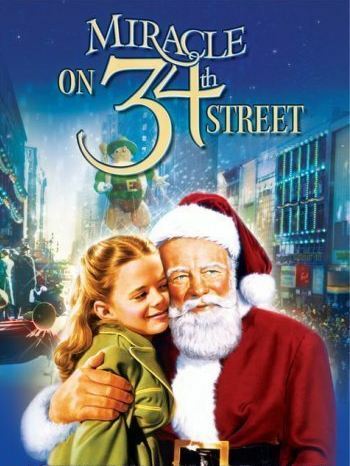 I also watch this movie every year, along with the Polar Express. 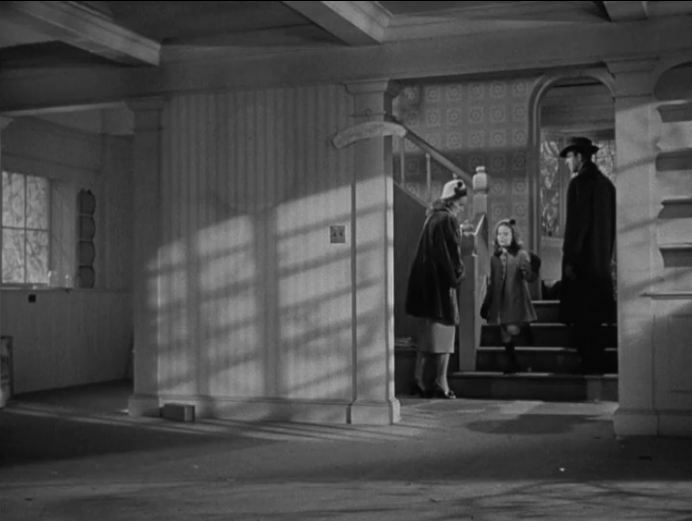 I appreciate how the design flows from room to room without a lot of ‘modernism’ taking over the character of the house. They did a great job of making the house light and airy while keeping the wood paneling from the past. Julia-I live near this home in Lake Forest. As lovely as it looks in the photos, it is even much more beautiful in person. The pitch of the roof is so dramatic and the home is much wider than it appears in the pictures. Is a bit off for me. What is up with the swan in the pink alcove above the massive fridge? Also not loving the window treatment above the kitchen sink, but over all an amazing house with an even more amazing property. Kind of looks like something in a dream, it has an almost unreal atmosphere about it. I love when a house “hides” how big it really is the way this one does. The northern suburbs of Chicago are one of my favorite places to do a little virtual house hunting. I missed that movie! I will watch it again this weekend. I was 7 yrs old at that time and i forgot much of the movie. So sad to know that the house is for sale. The house is gorgeous, 100% fabulous but it’s interesting that buyers aren’t comfortable with its price tag. 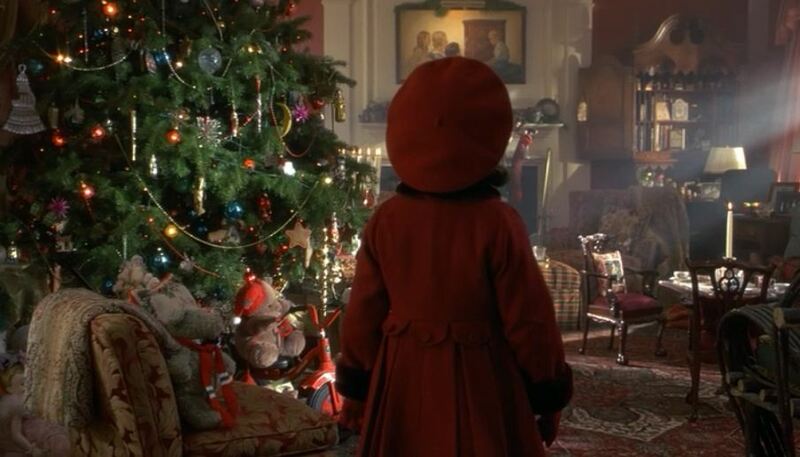 Hi Julia, this home has the same effect on me everytime I watch this beautiful movie. My husband has been playing the Lotto for a very…very…long time, perhaps one day. Thank you for sharing beauty. Before I forget NBC Today were talking about the return of The Gilmore Girls, I’ve been enjoying the re-runs. Have a wonderful weekend. Till next time regards Esther from Sydney. PS they were also talking to Francis Ford Coppola about his winery…just beautiful. Beautiful home inside and out. 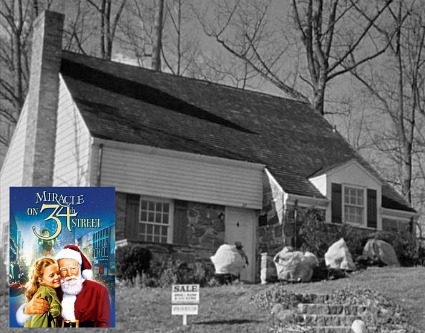 I’ve been by it many times and didn’t realize it is a “movie” home. I will be by there tomorrow and will have to do a extra slow drive-by to take it all in. The neighborhood that it is in is just breathtaking. I love strolling through the streets and looking at all the beautiful, well manicured homes. It always inspires me to get projects done on our home. Thanks for sharing. What a beautiful house! I love the library and backyard. They’re both beautiful and I’d spend a lot of time in each one.